Late on the evening of Feb. 7, Matt Rudinski, ‘12, was scrolling through his Twitter feed. On this seemingly quiet night, Rudinski found an uproar. Liberals were angry, and they had a new rallying cry. And Rudinski decided he had a role to play. It started earlier that night in the near-empty senate chamber in Washington, D.C. A session was underway, debating President Trump’s nomination of Sen. Jeff Sessions for attorney general. Sen. Elizabeth Warren stood at the podium and spoke against Sessions. Not with her own words, but with the words of Coretta Scott King, a civil rights activist and widow of Martin Luther King, Jr.
Rudinski, a graphic designer who graduated from Emerson with a degree in visual and media arts, saw the outpouring of support for Warren. McConnell’s phrase had especially tapped into the sentiments of women’s rights proponents. “I love the idea of getting back at congressional Republicans by using their own words,” Rudinski said. In about 15 minutes, Rudinski whipped up a quick design on teespring.com, a website that functions as a middleman for designers who want to quickly push their work on t-shirts and other merchandise. Rudinski’s simple white-on-black t-shirt design featured the phrase in all capital letters above an American flag. Instead of the traditional 50 stars, Rudinski placed the Venus symbol—often used to represent femininity—in the flag’s top right corner. As an added touch, Rudinski set up the shirt’s page so all proceeds would go toward Planned Parenthood. After posting the design on Teespring, he went to sleep. His goal was to sell 50 shirts. He awoke to 1,500 orders. That day, Rudinski started to push the shirts online, posting in the Emerson Mafia Facebook page, among others. He scoured Twitter for people that were posting about the phrase or the shirt and reached out to them. Rudinski believed his shirt stood out from others with similar ideas for two reasons: its design was clean and professional, and every cent was going to Planned Parenthood. By that afternoon, those 1,500 orders had grown to 15,000. “It took off like wildfire,” Rudinski said. Andrea Daly, ‘90, was one of the first to see Rudinski’s post on the Emerson Mafia page. She ordered a shirt for herself immediately, and then shared the link with other Facebook groups she belongs to, some with thousands of members. As of Wednesday night, just over 40,000 shirts have been sold, raising more than $375,000. Teespring has also enabled Rudinski to expand his campaign. The phrase is now available on a variety of items besides t-shirts, including mugs, yoga pants, and even baby onesies. The shirts even caught the attention of Walker Williams, Teespring’s CEO. Williams bought a shirt himself, and saw Rudinski’s design as a perfect example of Teespring’s popular charity feature. Rudinski has since created more products on Teespring for a variety of causes. Fifty percent of profits from shirts mocking President Trump’s tweets with “Fake shirt. Sad!” emblazoned on the front are going to the Committee to Protect Journalists. Others are raising money for the American Civil Liberties Union, the organization dedicated to protecting the rights of American citizens through litigation and lobbying. The ACLU has been in the news recently for opposing President Trump’s immigration ban. Because the “Nevertheless, she persisted” shirts are so popular, they will continue to be sold on Teespring. In addition, Rudinski plans to continue designing shirts and other merchandise as both a source of income and as a way to fund organizations he believes in. 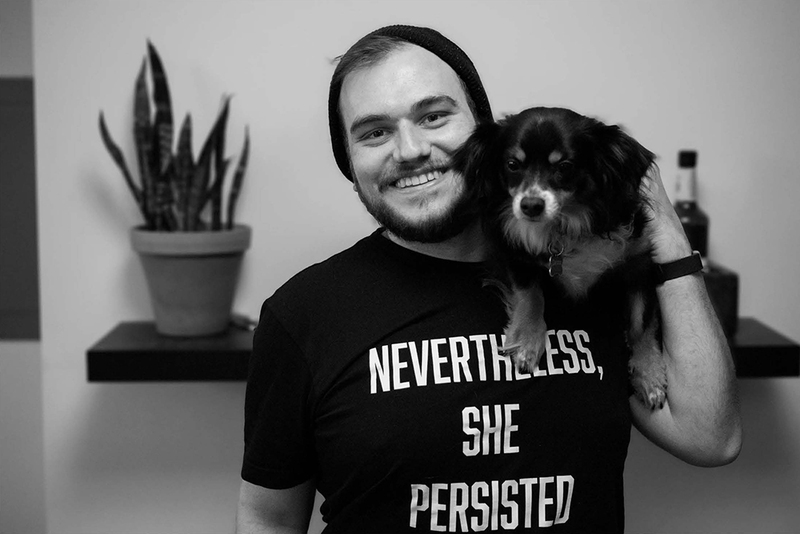 Correction: A previous version of this article incorrectly stated that the "Nevertheless, she persisted" shirts were only available until Feb. 23. In fact, they will continue to be available on Teespring.